I was just in London and found time for Trafalgar Square, to see what was sitting on top of the famous Fourth Plinth. In recent years this erstwhile empty pedestal (it was made in the 1840s to exhibit an equestrian statue that was never completed) has played host to works by Marc Quinn (Alison Lapper Pregnant, 2005), Thomas Schütte (Model for a Hotel, 2007) and Anthony Gormley (One and Other, 2009, in which members of the public ‘became’ the art work by booking hour-long sessions on the Plinth). 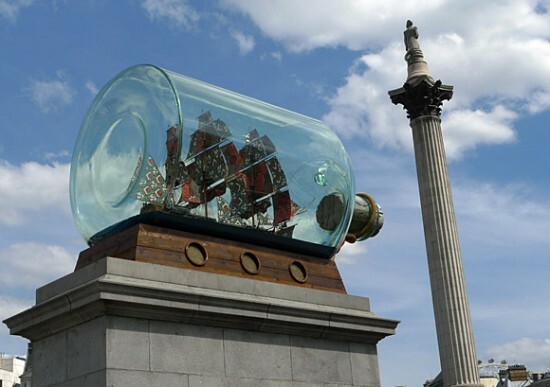 2010 has seen another sea change with the current Plinth commission, which is called Nelson’s Ship in a Bottle. It’s a model of HMS Victory, Admiral Horatio Nelson’s flagship at the Battle of Trafalgar, by British artist Yinka Shonibare: it is the first Fourth Plinth piece to tap into the historical currents of its context. 15 ft long and 8 ft tall, the bottle (with giant cork) was made by aquarium specialists in Rome. Best of all, the ship’s sails are all stitched from opulently patterned fabrics associated with African dress, because the artist wants to stress ties between the birth of the British Empire and Britain’s present-day multicultural context (he himself is of Nigerian descent). So today I’m turning from one Turner treasure to another, that’s closer to hand here in DC: the picture at the top is Keelmen Heaving in Coals by Moonlight (1835). This is not the bog-standard snap-shot of the slog of the industrial revolution that the title might suggest, no sir. 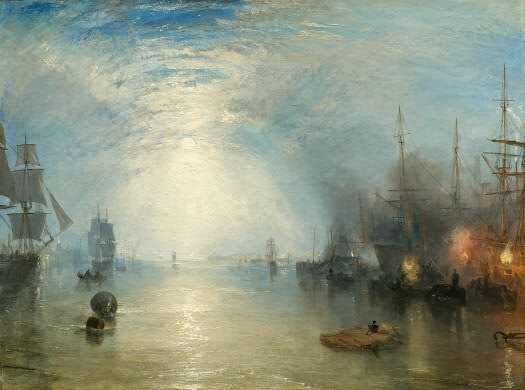 Instead, under Turner’s touch, a night-time of toil is transformed into an addictive vision of lush loveliness. From somewhat hairy beginnings (he was the son of a London barber), Joseph Mallord William Turner (1775 – 1851) grew into the most original and imaginative figure in the history of English landscape painting. Let’s look at what we love about him. First up the composition, in an of itself a revelation. The water channel is clustered either side with ships, rigging and distant factories, leaving an enormous space for a stunning sky to bounce in a barrel vault from left to right. And what a sky, guys. Turner was taken, nay preoccupied, with how to capture the effects of light. So here I think he started with a series of thin glazes (like varnishes) and then piled onto these thicker (impasto) layers. This is turbo-charged Turner moonlight: great gluts of bright white and crusted pigment make almost-palpable the glittering light of night. At the sides then, the keelmen and their squat solid vessels, the silhouettes of the ships and the distant shore-line seem almost eaten by the licking flicking flames and the surrounding smudgy smokes and watery vapors. 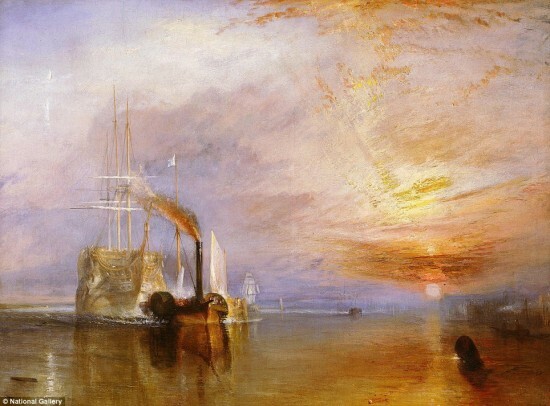 There’s a delicious sense of insubstantiality that’s typical of Turner at his most Romantic. Instead of a crisp and clean-cut impression of the men and machinations that make possible the conveying of coal from the north down the Tyne in keels and sailing ships, we’re thrust into a timeless landscape of nature and human-nature, working with and against one another. It’s as relevant today as it ever was. And he didn’t even need a bottle to keep it fresh.